Older readers may remember the shock of discovery when the first of Sviatoslav Richter’s discs made their way to the West. Since his first US tour in 1960, of course, he has been a fixture in the American musical imagination (although not in our concert halls), and we have been able to sample a far wider selection of his art in vastly better sound than that afforded by those early LPs. Still, as Richard Taruskin reminded us in an eloquent appreciation (13:3, p. 244), the Richter of the 1950s and early 1960s was a substantially more febrile artist than the “courtly, white-mustachioed elder statesman” he has become–and it is therefore not just nostalgia that gives his early recordings their magnetic character. BMG’s ten-disc celebration, reviewed in detail by Leslie Gerber in 19:3, resurrected a significant number of scorching early studio recordings. The five discs under review, although they retrace much of the some repertoire, document live performances, sometimes a bit sloppier than the studio versions, but often fueled by an even more impetuous spirit and reaching an even higher emotional temperature. Certainly, no one else manages to steer through the Schumann Toccata with such brio, largely because no one else, not even Horowitz, manages to shape the music’s syncopations so that the textures never clot. In part because of a quicker tempo, but also in part because of a greater sense of abandon, this fierce account of the finale of the Prokofiev Seventh is even more overwhelming than his famous studio version. And despite moments of apparent brusqueness (patience is not in high supply on these discs), this 1953 dash through Pictures is so impulsive as to make his classic Sofia account seem almost blasé. This is not the famous, and extraordinary, 1958 Sofia Pictures, taped in gritty mono before a Bulgarian audience apparently celebrating a bronchitis festival. 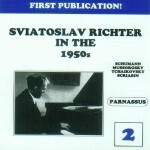 Rather, this is a fresh sounding 1952 mono version, taped before a nearly silent Moscow crowd. This Moscow version is much easier to listen to; it sounds, to my ears, more nuanced and coherent, and it lacks only the heaven-storming, galvanic strength of the Sofia final movements to merit a place in pianisms ultimate Valhalla. By any rational standard, this is a superb performance. The Tchaikovsky Concerto has rugged strength and some delicacy, but the orchestral sound is limiting and the USSR State Sym- phony under Nathan Rachlin sounds ragged at times. There are, frankly, better versions out there–including at least one by Richter.